After a hard month at work, Joel and I decided we needed a vacation and went on a spontaneous trip to Maui. We had originally decided to drive up the coast of California. A combination of factors changed our minds at the last moment: concerns about snow at the California national parks, and the fact that our friend Jon was planning to be in Maui and could keep us company. We had no trouble making last-minute arrangements or finding good deals. We bought our plane tickets on Thursday morning, made hotel and B&B reservations on Thursday evening, and flew off on Saturday. Our trip began with a drive from San Diego to LAX, from which there were relatively cheap direct flights to Honolulu. The plane ride was smooth, and because about half of the seats were empty I was able to stretch out for part of it. We arrived in Honolulu in the evening, but because of difficulties locating the shuttle we had reserved, we ended up at the Ohana Waikiki Hobron Hotel very late. The hotels in Waikiki are funny. They are all about the same height of fifty to sixty stories, but incredibly thin. The base of our hotel was probably not much larger than our house. Our hotel room had one of the most bizarre layouts I have ever seen. The effect was that the entryway, kitchenette, bedroom, and bathroom all felt like part of one long hallway. We were on the 41st floor, from which we had a great view of the city lights and a channel leading to the ocean. We could really hear the wind blowing up there. Joel found the sound worrisome, but I found the noise rather soothing. I worry about the fate of Waikiki, though, if it ever gets a really bad hurricane. We woke up before sunrise, got ready for the day, and took a stroll down to the beach. Along the way, we saw some banyan trees, remarkable trees that send roots down from their branches so that the trunk is actually a bundle of dozens of roots. We also saw some sand people, a man and woman made of sand sunning themselves on the beach. We made it back to our hotel right in time to catch our shuttle to the airport. It was a very quick hop over to Maui. Jon picked us up and we added Joel's name to the rental car. Jon drove us to Kihei on the southwestern coast of the island to meet his hosts, Margie and Drew. Jon knows Margie from Indiana, where they grew up on the same block. Both Margie and Drew were very nice and friendly. They recently graduated from college and decided, before getting bogged down with graduate school and careers, to spend a year living on an island. They both got jobs just down the street from their apartment; Drew worked at Denny's, and Margie worked at the Honolua Surf Company. Since the beach was also just down the hill from their apartment, they didn't have to travel very much. Maui has an interesting mix of wealth and subsistence living. Land and housing prices seemed comparable to the wealthier areas of California, and gas and food prices are tremendously high because most things need to be transported to the remote island. 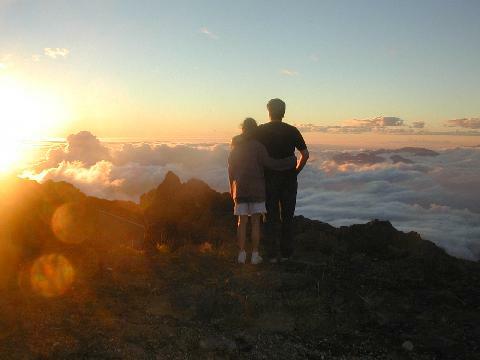 On the other hand, it seems possible for just about anybody to make a good life for themselves in Maui. Drew told us that most of the night crew at Denny's is homeless by choice; they work at night and spend their days surfing and sleeping on the beach. Hitchhiking is an important form of transportation on the island. Jon, Joel and I bought tour tickets at a booth by the beach. The booth operator was a friend of Margie's and gave us discounts on the tours. Then we drove to Wailea and ate lunch outside at Longhi's while scanning the ocean for signs of spouting humpback whales. At the shopping center we bought some essential supplies: binoculars and underwater cameras. In the afternoon we picked up Margie and Drew and drove to Kula so that Joel and I could check in at Puluke Farm Bed and Breakfast. The B&B was one of the nicest I have ever stayed in, beautifully decorated and inviting. It had a kitchenette, a living room and dining room area, and a large wraparound porch. All sorts of fruits and goodies were set out for us. It also had several cats, including the world's friendliest cat, Mimi, who lay on the bed with me and insisted on non-stop petting. One of the biggest appeals of the B&B was the view. 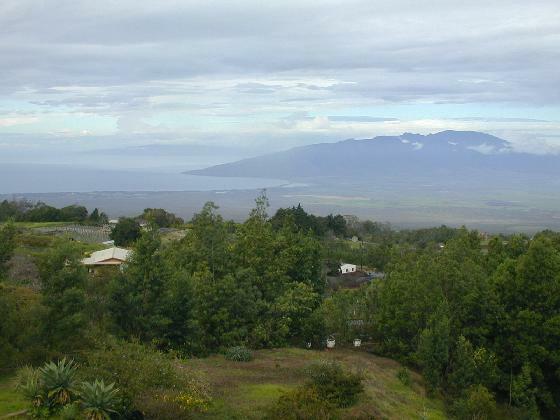 Maui is shaped roughly like a peanut, with a circle of mountains at the west end, the 10,000 foot tall volcano Haleakala at the east end, and a narrow valley in the middle. Kula is nestled partway up Haleakala. From our porch we had an amazing view of the whole valley, the southern coast of the island, and the west mountains. We could also see the northern coast peeking through the trees. The whole atmosphere of the scene varied depending on the clouds and the sunlight. Jon took the five of us to dinner at the Four Seasons Resort, where we had a very expensive but delicious dinner that seemed to melt in our mouths. Joel and I woke up early to pick up Jon and head to Ma`alaea for snorkeling. Our tour was run by the Pacific Whale Foundation, a non-profit conservation organization. The boat took us first to Molokini Crater, a small semicircle of exposed rock off the coast of Maui that harbors reefs of coral. On the way to the crater, we saw some large pods of humpback whales playing on the surface. It was an amazing sight, but the boat couldn't linger too long. Before mooring in Molokini, we were warned not to play with the concrete slabs (which we never actually saw). The slabs were put there to cover live mines that were planted there during WWII and were too dangerous to haul out later. Snorkeling in the harbor was very enjoyable. (It wasn't as scary as my last deep-water experience in the Caribbean because I had a working flotation device.) We saw butterfly fish, angel fish, sea urchins, and hundreds of other brightly colored fish. We also saw a golden speckled Moray eel, who at first had just its head sticking out of a hole in the rock as if waiting for lunch to swim by, but who then came out and lazily skimmed its way along the ocean floor. Our second stop was along the southern coast of Maui. The fish there were not quite as colorful as in Molokini, possibly because they were further under the surface and not hit by the full spectrum of light. However, I did catch an amazing sight: a sea turtle swimming towards me until it was just about six feet away. We had lunch on the boat and sunned ourselves until arriving back in the harbor. Poor Jon was not doing very well at that point, due to swallowing a bunch of salt water, but the boat crew was understanding and gave him lots of ginger ale to settle his stomach. After the tour, we spent a long time shopping in the Pacific Whale Foundation store. We signed some of their petitions and Joel got a Foundation membership (mostly because he liked the T-shirt that comes with membership). In the afternoon, Jon and Drew went on a helicopter tour of the island. Joel read on the beach in Kihei, but I found it much too windy and sandy so returned to the apartment to relax. Joel and I had a wonderful dinner at a nearby Thai restaurant and then returned to our B&B. 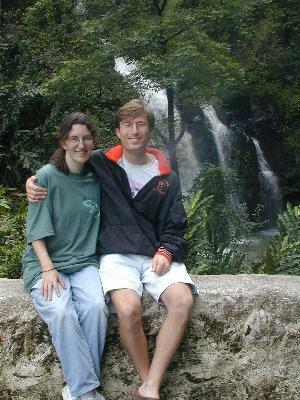 We spent the whole day with Jon, Margie, and Drew driving to Hana. "Driving to Hana" is a local phrase meaning not so much the act of driving or arriving in the small town of Hana on the eastern coast as it does experiencing all of the sights along the way. The road to Hana is a twisty little two-lane highway punctuated by dozens of one-lane bridges. 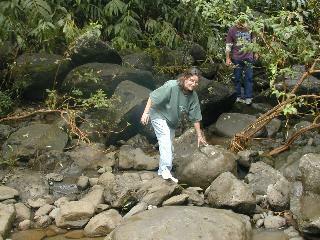 It runs along the northern coast of Maui and passes by numerous waterfalls, exotic trees and plants, and rocky beaches. The sights along the road are poorly marked, so we brought along a CD guided tour that told us what was worthwhile seeing along the way. We stopped first in the town of Makawao and visited its little row of shops. Jon found a glass shop and bought the first item in his soon-to-be glass collection: a colorful jellyfish encased in a clear glass bell. 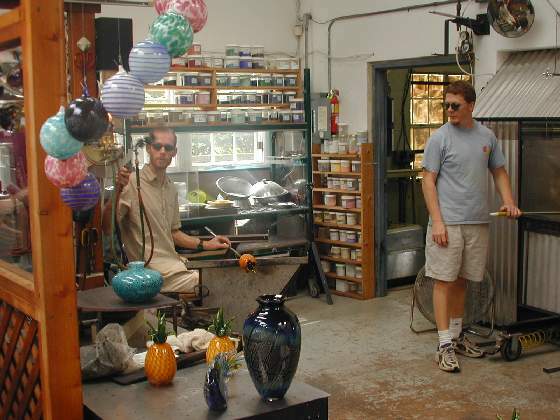 The glass blowing equipment was sitting in the shop itself to be viewed by the customers, and two glass blowers were hard at work. An insurance company had recently put in a special order for 110 glass pineapples, and it was fascinating watching the artists churn out one pineapple after another. They made it look effortless, but in fact it took them years of experience to gain a feel for the materials. We stopped next in Paia to eat lunch at "The Vegan." Then we spent a while at an overlook to watch surfers at the beach below. We got out of the car to enjoy one of the many waterfalls. We walked a short way up the falls, being careful to keep our balance on the trail of slippery rocks and tree trunks. At the bottom of one waterfall was a small circular lagoon that looked like it might be pleasant to swim in on some days but was all churned up and muddy when we saw it. We took a side road down to the ocean and spent a while at the beach. 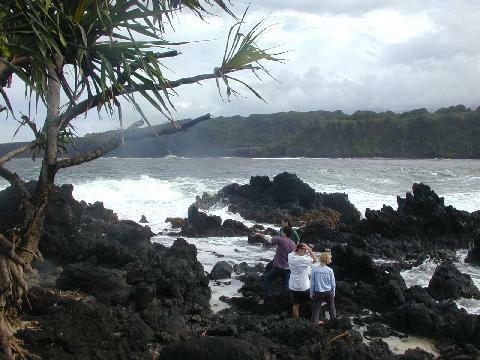 The coast line was made up of large chunks of lava, the perfect harbor for tidepools. On the rocks we found hundreds of small sea snails in a very distinctive black shell with a white dot. In a nearby tidepool we spotted hundreds of tiny hermit crabs, the majority of them sporting the same distinctive shell. Hmmm... I wonder where they got those from! There were also a few small fish swimming in the protected pools. The waves at the beach were amazing, tall and powerful and making big splashes of white foam as they crashed against the rocks. It was really a magical place, and I wished that I could spend the whole day there. After a few more quick stops we arrived at Hana Bay. The bay had a beautiful sandy beach as well as more of the lava rocks that I had enjoyed earlier. Joel and I headed right for the rocks, but this time we got too daring. We ended up turning away from a huge wave just in time for it to spray our backs. As we were getting ready to leave, we were greeted by Phil, a friendly local who makes jewelry and is into yoga, meditation, aikido, and other things. I made my escape from the conversation while he was giving Joel a heartfelt and specific, but completely inaccurate, psychic reading. Joel left the conversation a short while later, but the other three seemed interested by it, so Joel and I enjoyed the beach some more until it started getting dark and was time to head back home. Along the way we had a wonderful dinner at Jacques' Bistro in Paia. 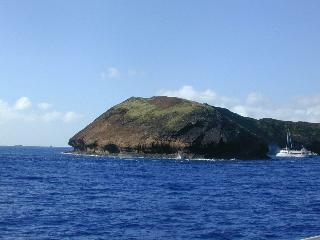 In the morning, the five of us enjoyed a submarine dive near Lahaina on the western coast. We took a short boat ride out to the submarine, and our guide spent the time telling goofy jokes. Once in the submarine, we were each seated in front of a portal, and then the submarine dove down 100 feet to the ocean floor. We started out following some rays, but stopped short when the submarine operator was surprised by a bottlenosed dolphin. 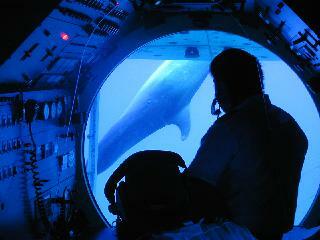 The dolphin suddenly came up from beneath the sub and placed itself right up against the front portal. It appeared that it had a little sea urchin attached to its back and was rubbing itself against the submarine to get it off. We were sitting towards the front of the sub and had a great view! As we continued along the ocean floor, we saw a number of spiny sea urchins and many-legged sea stars. 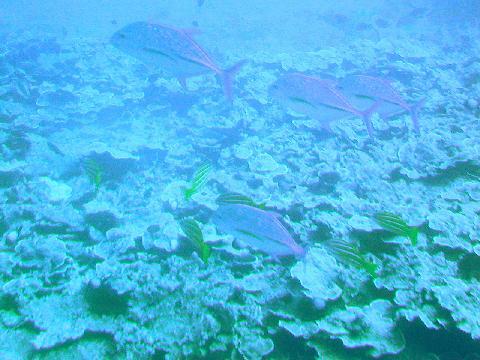 The real swarm of life came into view when we reached the coral reefs. There were thousands of fish of all different varieties, some of them swimming alone and some of them traveling in large schools. Our guides explained that the large schools were of nocturnal fish, who bunch together for protection while they sleep. We noticed that the stripes on these fish blended together, hiding the outlines of the individuals. My favorite waking fish were the long tubular trumpet fish. The fish we saw would have been amazingly vibrant and colorful, but the loss of the full spectrum of light at that depth caused everything to have a washed-out appearance. After the submarine ride, Joel and I bought tickets for a whale watching trip and then hurried to catch the boat leaving from Ma`alaea Harbor. 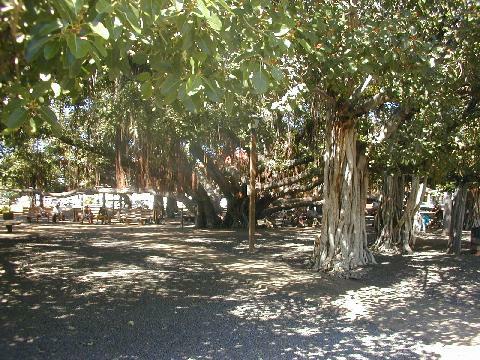 We took a few minutes in Lahaina, though, to admire a spectacular 130-year-old banyan tree. The base of the tree looked like a whole grove of tree trunks, but they were all part of the same tree and the dozens of trunks were actually roots shooting down from its outspread branches. Altogether, the tree stretched out the width of an entire city block. The conditions on the ocean were nice and smooth for whale watching, but because it was later in the day and quite hot, there wasn't much surface activity. Our boat would head towards a spray and arrive just in time to see the whale's fluke as it dove down. We thought the trip was going to be a bust until we were almost back to the harbor. Nearing the shore, we were just in time to see a mother humpback whale teaching her calf how to breach. She would leap out of the water and make a huge splash coming down. The the little baby would poke its tiny head out of the water as far as it could. The jumps went on and on for several minutes. To encourage her little one, the mother would slap the water with her 15-foot-long pectoral fin. Joel and I had unprecedented success with our license plate game this day. We found 22 numbers over the course of the day and calculated that a local could be done with the game in well under two months. We attributed our success to the long stretches of two-lane highways and the high ratio of "real" plates to vanity plates and specialized vehicle plates. Jon picked us up after the tour and the three of us made the long winding drive up to the summit of the Haleakala Crater. After a few minutes of driving through clouds, we finally found ourselves above the cloud cover and were treated to a spectacular view. 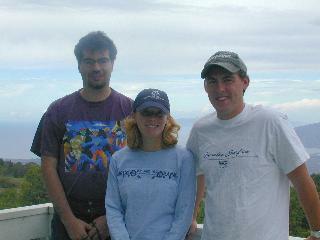 The summit itself was cold and blustery, the result of winds being pushed up and over the top of the mountain. 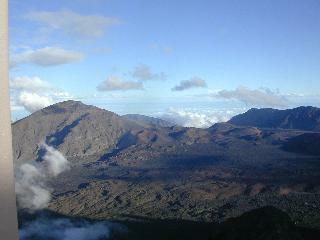 A few days earlier, Haleakala Crater had received its first snowfall in a decade. Many people waited in traffic for hours to experience this unusual event, and some of them brought truckloads of snow back down to the beach. By the time we arrived, both the traffic and the snow were all gone. We stayed on the mountain until dusk and saw a very nice sunset on the way back down. Driving in the dark, we had to be careful of the many free-roaming cows grazing by the side of the road. We brought Jon back to the apartment to pack, said goodbye to Drew and Margie, got a quick takeout dinner at a popular taco shop, and brought Jon to the airport in time for his red-eye flight back home. We spent the morning doing chores: packing, mailing postcards, and shopping for coffee and chocolate-covered Macadamia nuts to bring back with us. 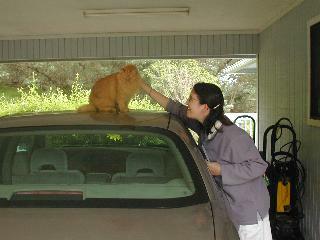 We had a hard time saying goodbye to Mimi, the world's friendliest cat, because she had parked herself on top of our car. The flight back to LAX was very empty, so we again had our choice of seats. We arrived back in San Diego late at night, but feeling well rested and ready to get back to work.